TREE HOUSE LOUNGE Friday NOV 20th!! Thank you Jammin’ Java, Lindsey Buckingham Palace, and Zero for a great night of ROCK! After our SOLD OUT show at Jammin’ Java we are once again teaming up with our friends Lennon English & New Soul Republic at the Tree House Lounge! 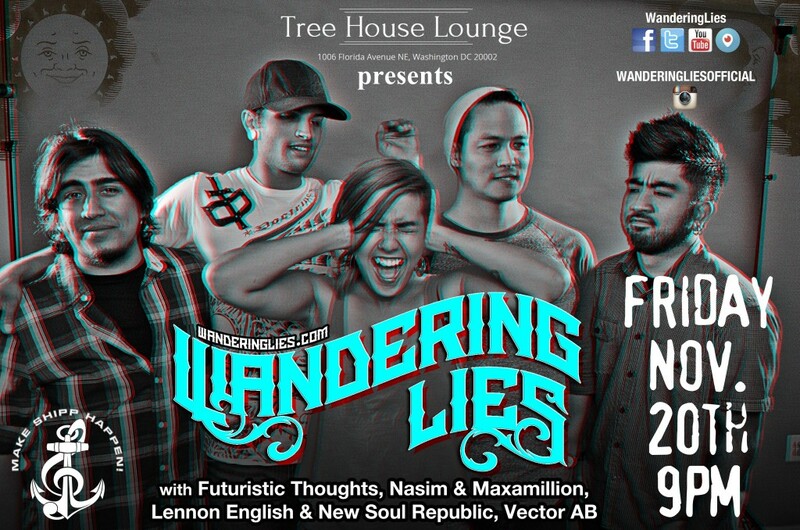 Also performing: Futuristic Thoughts, Nasim & Maxamillion, and Vector AB! Keep the momentum going! JOIN US for a Friday Night of great local music!! We’re performing at JAMMIN’ JAVA (Vienna, VA)!!!! Mark you calendars!!! 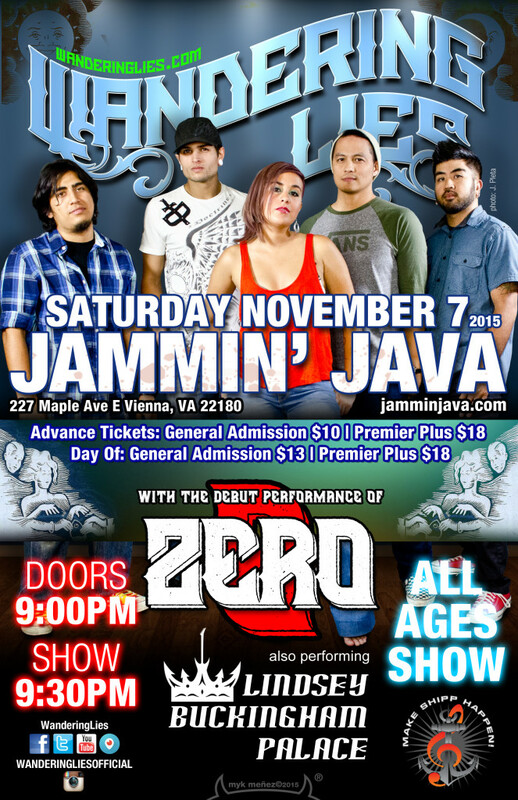 Saturday, November 7th it’s going down! 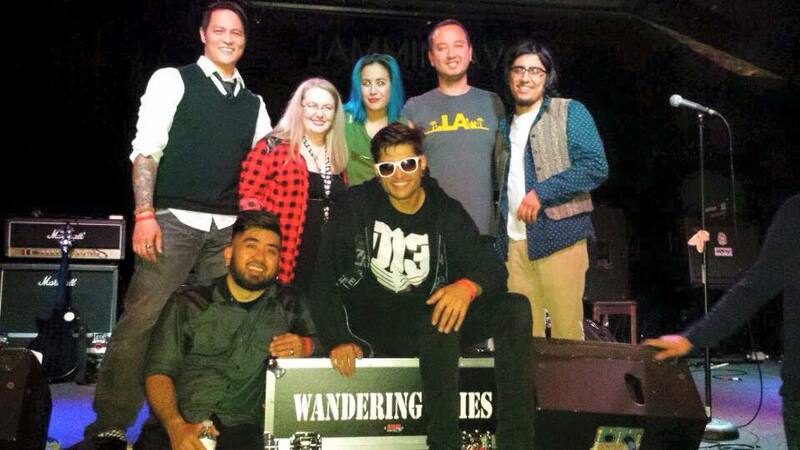 Wandering Lies is headlining an AMAZING lineup at the always fabulous Jammin’ Java!!! We’ll be featuring a bunch of new songs that we’ve been working on in the studio!! Come out and see the debut of a new band called “Zero” featuring some familiar faces from The Speaks! Also joining us on the bill are our good friends Lindsay Buckingham Palace! This is an all ages show and it will sell out so see anyone in the band for your pre-sale tickets!! Thank you Baltimore & Fat Tuesday! Despite in-climate weather we had a great show at the Hard Rock Cafe in Baltimore [and 98 ROCK]!! Can’t wait to return! Great performance to our co-performers Amaretto Meltdown! They rocked the stage!! HARD ROCK CAFE – BALTIMORE!! Thank you Fat Tuesday for another great night of music! And a special thanks to Lennon English and New Soul Republic! They put a serious groove in the night that we are still tapping our feet to (driving to work-ugh!). What’s next for us? More writing & recording… stay tuned and thanks for supporting us and coming out to rock with us!! Last minute SHOW! But its a good ONE!!! Come rock with us as we make waves at Baltimore’s Inner Harbor presented by 98 ROCK and hosted by Hard Rock Cafe Baltimore!!! We’ll be opening the evening (performing first) so get here early and make it a rockin Happy Hour with us!!! Rock the Dock with 98 Rock every Thursday on our outdoor pier, starting at 6PM! Join us for free local live music by some of Baltimore’s best musicians! ROCK the DOCK!! – HARD ROCK CAFE BALTIMORE! FAT TUESDAY AUG 21st FRIDAY!!! We’re rocking Fat Tuesday’s in Fairfax again! If you missed the last time we played there [you missed out on the mayhem] DON’T MISS OUT THIS TIME!!! Together with Lennon English of NEW SOUL REPUBLIC we’ll be starting the festivities at 9PM!! 21+ w/ $5 Cover! IT’S ALWAYS A ROCKIN BLAST OF A TIME!! !